Over the past several decades, the tobacco control movement has used many effective strategies, including hard-hitting media campaigns, smokefree air policies, and tax increases, to help deter kids from starting to smoke, and encourage adult smokers to smoke less or quit altogether. But the tobacco industry spends an exorbitant amount of money in retail outlets where tobacco products are sold, using promotions and marketing to persuade adults to continue smoking and urge youth to start. These practices have convinced many jurisdictions that the retail environment should be regulated to limit the public health effects associated with tobacco use. Local tobacco retailer licensing (TRL) is an extremely effective regulatory approach. Under a TRL law, government requires all stores that sell tobacco to obtain a special license for the privilege of selling these products to consumers. The license system allows government to monitor local businesses and make stores healthier places for everyone to shop. TRL can be used to implement different strategies in the retail environment, and it can address multiple community concerns simultaneously, such as youth access to tobacco, youth exposure to marketing, retailer density, and retailer location. ChangeLab Solutions developed this easy-to-use playbook to outline the ten strategies necessary for developing, implementing, and enforcing a comprehensive TRL policy. It provides all the steps and considerations involved in building support for TRL, and includes examples and key resources to help communities create a strong local policy that improves public health. 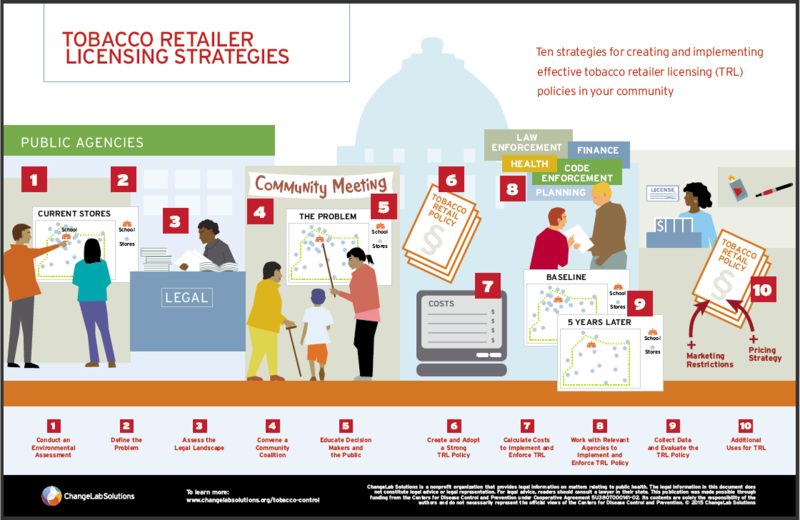 You can download the Tobacco Retailer Licensing Playbook and Playbook Strategies Poster below. Be sure to check out our other resources on tobacco retailer licensing, including our infographic on reducing tobacco retailer density. Contact us for technical assistance on implementing TRL in your community!